Peonies are suitable for every festivity, some peonies more than others. 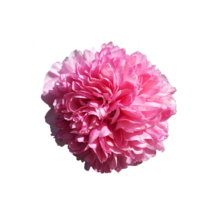 Salmon Glory is such a peony: stunning salmon pink bombs with a size up to 20 centimetres! This peony can't be described easily. We think she is just too special, outstanding and charming for words. The buds of the Salmon Glory are enormous: her flowers can reach a size up to 20 centimetres! Her steals are thick as well, but not strong enough to keep the flower up. In a supporting vase or a bouquet, this shouldn’t be an issue anymore. Salmon Glory offers all the pros you would expect from a fine peony. Unfortunately, she is hardly available at this moment. Luckily, this is going to change in the future: this peony will steadily enter the market in 2020. Although you wouldn’t expect it, Salmon Glory got already registered by Glasscock in 1947. She entered the market many years later. We don’t know why, because she has such a summery personality and she blossoms early. A hidden pearl, but luckily, she was discovered by many peony fans. By the way, Glasscock has registered more beautiful peonies: Mother’s Choice for example. As said, Salmon Glory’s buds are rather heavy because of her strong growth. A high, supporting vase is recommended.